When it comes to social marketing, Google+ is one of the most powerful social networks that you can use. It is not only great for personal networking, but it can also work wonders for your business by connecting with like-minded consumers, vendors, and partners. 1. Construct highly focused circles. 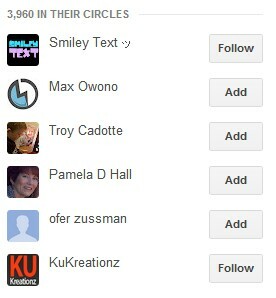 When it comes to Google+, you connect with people through circles. To make the most of this circles-system, you'll want keep your circles organized and highly focused. So what is a focused circle? This is a group of people who have similar interests and aspirations, whether in their personal lives or business-wise. Before including people into a particular circle, you should establish what mutual benefits and aims you have in common. By using circles, you get the opportunity to determine what your target demographic wants and figure out how best to provide it to them. 2. Sharing should be focused. Emphasis is being put into the word focused since this is pertinent when it comes to online marketing. When it comes to generating traffic for your website, it is not simply about getting all and sundry to visit your website. It is about targeting specific people that will grow your business, and not simply visit your website and not do anything about it. Focused sharing ensures that you are reaching a targeted audience that will boost your sales. They will not only click the link to your website, but chances are they will also purchase your products, sign up for your mailing list and possibly recommend you to the people in their circles. This will not be achieved when you are only getting generic traffic to your website. 3. Search engine optimization. By using Google+, you can increase the chances of capturing greater search visibility and higher rankings. Google keeps updating its search engine algorithms and one common trend we're seeing is how Google is integrating highly relevant social activity with search. By using Google+ to promote your content, you can further increase your online visibility. In addition to this, having a Google+ account will verify that your content is more credible and valuable, depending on how popular it gets. A number of online business owners tend to have outdated content since they are not staying abreast with these trends. If you would like to increase targeted traffic and become more popular on Google+, you should know what's hot in your particular niche, and be timely to share it with your audience. 5. Contact your target audience. With Google+, you should no longer send mass updates to everyone. Instead, you can direct them specifically to the individuals that believe in your business. Your circles will act as email lists to subscribers who genuinely want additional information. Google+ is surely a life force you'll want to join. Google+ is empowering companies in so many ways and helping new entrepreneurs grow viral in a matter of days.